France and Marseille midfielder Mathieu Valbuena escaped unhurt after writing off his car on Christmas Eve. The diminutive playmaker crashed his Lamborghini near Bordeaux while returning to his family home for Christmas, a police source told AFP. The reasons for the accident were unclear, although police noted that the road was slippery after heavy, icy rain. 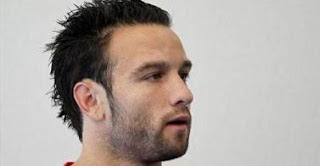 Valbuena was able to return to his family after the accident, with the same source adding that the car was heavily damaged and unlikely to be roadworthy.